Beaver Timber is a Kansas City-based supplier of reclaimed, recycled and salvaged wood. We provide reclaimed wood flooring, beams, paneling, lumber and barn wood. Our customers include homeowners, commercial property owners, builders, contractors, designers and architects. We also supply small batch stock for cabinetmakers, furniture makers or other woodworking projects. Besides its timeless appeal, reclaimed wood is a green alternative and endorsed by Leadership in Energy and Environmental Design (LEED). We also supply small batch stock for cabinetmakers, furniture makers or other woodworking projects. Reclaimed and salvaged wood comes from a number of sources. Wood can be sourced from older houses, barns, farmhouses, warehouses and factories that are being torn down. Wood is also salvaged from submerged logs and storm-damaged trees. Much of the reclaimed and salvaged wood we obtain is from 50- to more than 100-years old. After the deconstruction or salvage phase, we bring the wood back to our facility in Kansas City, Kansas. This is where we process each piece, transforming what would have been burned or destroyed wood into reusable lumber for homes, offices and commercial buildings. Consider using reclaimed wood for your home, office or commercial project. Whether you are looking for a few wood beams or need 10,000 square feet of reclaimed wood flooring, we can help. Contact us today for more information about Beaver Timber’s reclaimed and salvaged wood. We carry a wide selection of wood species and sizes. Lengths typically range from 2 feet to more than 36 feet. We regularly obtain pine, hickory, cypress, poplar, beech, elm, cherry, cedar, oak and walnut wood species. Flooring sizes range from 2 to 10 inches wide and up to 30 feet in length. Occasionally we acquire wider and longer flooring – let us know your preferred dimensions and we’ll do our best to source it. 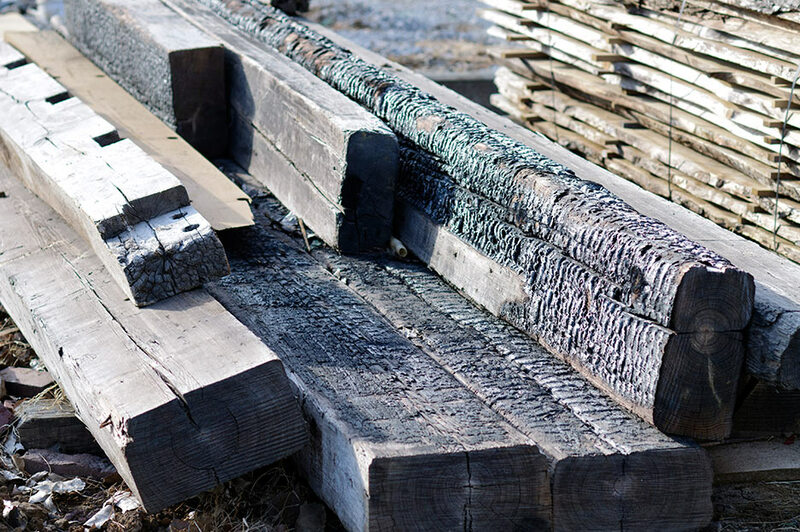 Whether it’s reclaimed wood or salvaged wood, it must go through our wood processing system, that might involve some or all of the following processes. Sorting. Wood arrives at our production facility and is immediately sorted according to species and grade. Scanning. Incoming wood must be scanned for nails, other metal elements and undesirable traits, such as severe gouges. Scanning might be the most time intensive part of wood reclamation. Air Drying. After scanning is completed, reclaimed wood is stored for air drying. Some wood, such as beams and timbers may be sawn to common specifications before storing. Kiln Drying. Some wood requires more than air to get it to an appropriate level of moisture content. To achieve, for example, a moisture content of 6-8%, the wood is placed in an insulated chamber, similar to an oven, that regulates and removes unwanted moisture. Custom milling. Our skilled, wood craftsmen custom mill the various wood construction materials by sawing, planing or cutting to customer specifications for wood flooring, beams, siding, doors, mantels and more. Last but not least, we prepare each customer’s order of wood for shipping, whether it’s going around the block, or around the globe. Beaver Timber will ship anywhere within the continental U.S. We’ll coordinate transportation, handle the paperwork and ship your reclaimed wood to you promptly and efficiently. Whether you’re looking for large volumes or a small quantity of good-quality, reclaimed wood, contact us today. We buy reclaimed wood from owners of barns, warehouses, factories, log cabins and more. If you’re interested in selling antique wood to Beaver Timber, please call or e-mail us with information about your wood resources. Tell us of the source of the wood, such as a warehouse, barn or cabin; describe the wood species and type (siding, floors, beams, etc. ); and give us an idea of the quantity of wood available. Send photos, too, if you can. We’d love to do business with you and keep antique wood from entering a landfill or burn pile. We’re also interested in trees that may fallen or died; they often yield beautiful, salvageable wood.